A report from the BBC complains that Apple isn't replacing the battery on some iPhones with damage, re-launching ridiculous complaints that the company won't fix everything put in front of them. The report by BBC's Watchdog show highlights users who contacted the show after Apple refused to replace a battery in an iPhone. All of the complaints were made after an iPhone was sent to Apple for service, and rejected because of damage. In one case, Josh Landsburgh sent his iPhone to Apple to have the battery replaced in February. Two days later, Landsburgh got an email from Apple rejecting the repair on the grounds of a "small dent" —which Apple would fix for 200 ($272) if he had opted to do so. Landsburgh turned to a third-party repair shop to replace the battery, leaving the dented case intact. In another case cited by the BBC, David Bowler claimed that his iPhone was in "perfect condition" but needed a battery replacing. Apple returned the device, claiming that there was internal damage to the microphone and speaker. 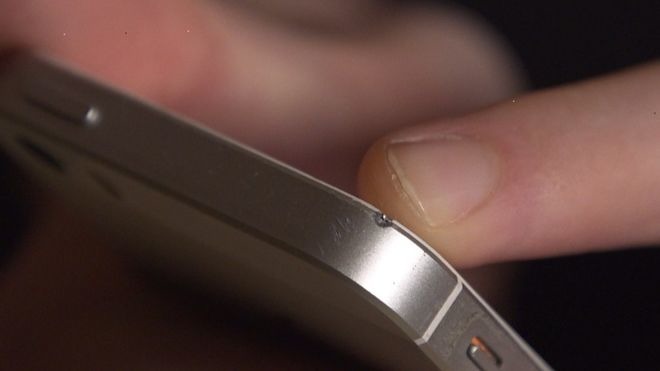 An un-named third-party repair shop was consulted by the BBC, and were told that "obviously these things are working; they shouldn't say that they are faulty." "If your iPhone has any damage that impairs the replacement of the battery, such as a cracked screen, that issue will need to be resolved prior to the battery replacement." Furthermore, like with the Linus Tech Tips iMac Pro saga, Apple's terms and conditions of any repair, say that Apple can refuse repairs based on any damage caused by the user. The difference again is how users want to interpret this, versus how Apple does from a legal and accountability issue. In the first case, we see the "dent" but the damage goes beyond that. The screen assembly is chipped as well. Tensile strength of a screen drops dramatically with even minute chips or cracks, as demonstrated practically by a windshield chipped by a rock. Tolerances in the iPhone are very tight, and a case dent elsewhere doesn't need to to be profound to start impinging on the battery or other components. Too-tight tolerances cause problems with batteries, a matter that Samsung is all too familiar with. In Bowler's case. the third-party repair shop's comment as gathered by the BBC is a red herring. Just because something is working, doesn't mean that it isn't damaged —ask any hard drive user who has dealt with increasing drive noise over time. As a general rule, Apple's diagnostics are more trust-worthy than an un-named third-party repair shop's assessment. The question is not if Apple is refusing battery replacements for other issues. They clearly are. Apple is interpreting their statements and policies in a restrictive fashion —and in the same way that Dell, Samsung, and every other manufacturer that provides first-party service can and does. In the case of the battery, or a failure of any other part that isn't covered under the default one-year warranty, Apple is under no legal obligation to repair a device despite how much users may want them to be compelled to do so. Leaving damaged parts inside an iPhone, even if the customer wants them to stay in there, is problematic from a service accountability standpoint. Failures of, say, a motherboard, after a battery repair job are often blamed on a service provider well after the repair job is over —and there's no good way for the service provider to disprove the claim. A dent is user-induced damage, and Apple is choosing to not replace batteries because of them. A speaker that works that doesn't pass diagnostics is still a failed component, and Apple chooses to not be "on the hook" for that part later, should it fail a day, a week, or a year after the battery replacement. If you don't understand that, spend a week in a high-volume service department someplace. You'll understand after you do.